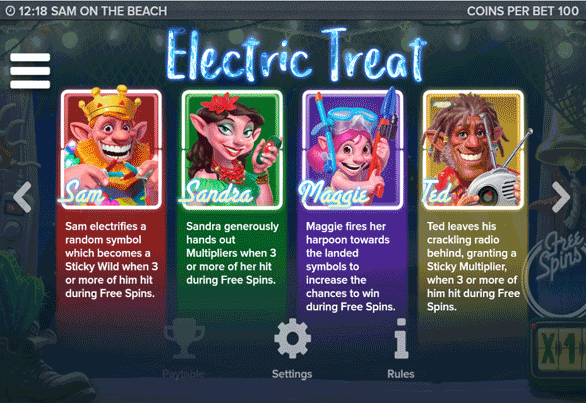 For any of you who love our friend Electric Sam, you no doubt want to discover more with this online 5 reel slot game. Join Sam, and meet the rest of his family on their coastal adventure holiday to the beach, each of them giving you their own special prizes when the reels align themselves correctly. This online video slot features a paytable that allows you to strategise your betting and earn yourself more considered cash rewards, free spins, and prizes. If you are looking for more exciting games, view online UK slots here. 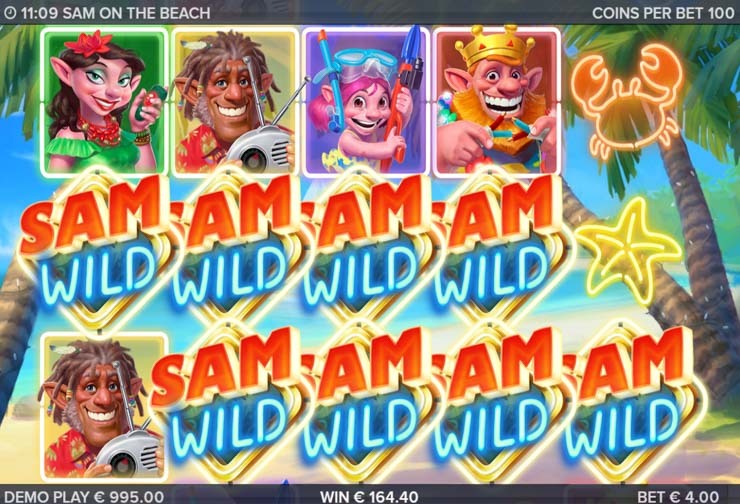 Sam on the Beach is developed by Elk Studios, a provider of great games for the online casino market. They pride themselves on wanting to learn more and creating games with crisp art and animation combined with the latest statistical models to form the mathematical foundation of each game. Their animations use advanced algorithms to bring their characters to life. They have a particular emphasis towards creating mobile versions of their games for the modern mobile casino. Click view latest slot games today. Sam is a troll with a red beard and a golden crown. After all his hard work in the Electric Sam game, he is taking a well-deserved family break in the Caribbean. 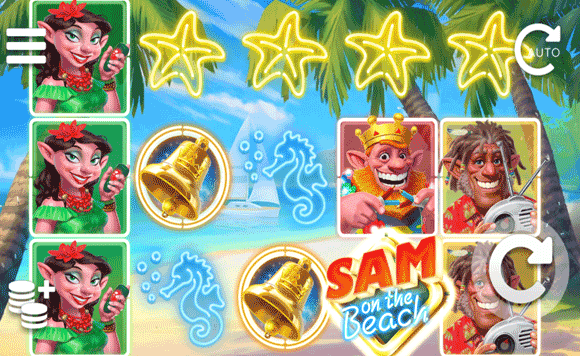 Sam on the Beach (Caribbean Vacation) is a fun slot themed around Sam’s visit to his Uncle Ted. His wife Sandra loves spending time on the beach and their daughter Maggie likes to play in the sea and get up to pranks. This cheerful and vibrant game has a big future ahead, to become one of the best UK slot online. This is a bright and cheerful slot with the emphasis on fun. Set on a Caribbean island, we visit Uncle Ted’s beach hut in the intro and a view a selection of family holiday snaps which are animated as we arrive on the beach. We are surrounded by golden sands and Coconut Palm trees. Uncle Ted is a happy Rasta troll, with funky dreadlocks and a transistor radio for pumping out the Calypso rhythms we hear when we play a reel. In between reels, we can also hear the soothing sound of the waves breaking on the shore, children playing and the calls of birds of paradise. This truly is a fun and relaxing slot game. The design is very current with collapsible ‘doughnut’ style menus and a clean approach allowing comfortable play on a pc, tablet or smaller mobile device. The game is a 5 reel, 3 rows slot with 243 winning combinations. The reel symbols include all the main characters of Sam, Sandra, Maggie and Uncle Ted in iconic poses. Neon crab, starfish and seahorses complement the beach theme. The “Sam on the Beach” logo is the game’s Wild symbol that substitutes for all other symbols except the bonus Bell. A horizontal line with all four family members triggers a re-spin with 4 Sticky Wilds. A combination of at least 3 Bells triggers the Free Spins bonus game. Every bonus Bell during Free Spins generates an additional free spin. A sunny, relaxing and bright game that is immensely fun to play. It evokes the atmosphere of a family holiday on a paradise beach. The graphics are vivid and crisp and colourful. The quality of the animation really brings this game to life. The characters are likeable and integral to the game. We particularly enjoyed playing this slot on a mobile phone. Another great game to try is foxin' wins.